Tonight we are talking Cauliflower. I know there are a billion amazing things you can do with this versatile ingredient. For now, we are going to focus on a fast, flavorful application. I have plans to show what else you can do with cauliflower as we move along. 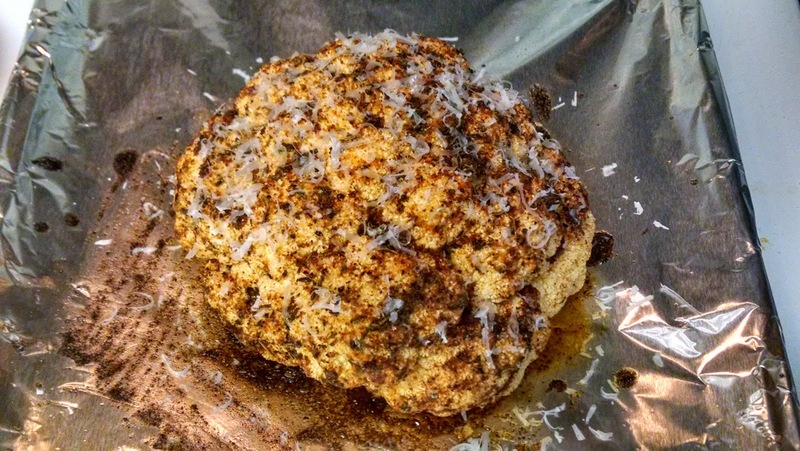 OK, tonight is roasted cauliflower. This application would also work with broccoli if that is more to your liking. Like our roasted carrots, the application is very much the same. It starts with a 400 degree oven. Feel free to use your choice of seasonings. I think I will use olive oil (1 1/2-2 tbps), salt (2 tsp), pepper (2 tsp), a little garlic powder (1/4 tsp), and to give this some complexity, paprika (2 tsp). You may need to adjust the seasoning level so be sure to taste as you go. Remember, it is easier to add seasoning. So, if you are unsure just add less. Not only is paprika readily available, but it provides some really nice earthy, smokey notes to anything. We use it in a lot of dishes for that reason. If you are really into paprika there are a number of varieties that are sweet, spicy, earthy, a little floral, and a bit acidic almost. Don’t worry, you can mellow those really easily, but it makes for some great flavor. You know what, forget that. I want this whole head on a silver lined platter! Yes, we are going to roast the whole head of cauliflower. Here is your reward. Remove the leafy, green bits and cut the stem so it sits flat on the tin foil. This will make it much easier to wrangle. Time to practice being Picasso on your cauliflower canvas. Quick review, this is seasoned with olive oil, salt, pepper, paprika, garlic salt, and a bit of dried thyme. After 45-60 minutes you have arrived at your destination. The best way to know if it is done is to just pierce the cauliflower with a knife. If the blade passes through easily, then success! If not, let it go a little more. Tip: If you think it is almost done, but you don’t want to over cook it, just shut the oven off and leave it in till you are ready to serve. This does two things, you keep in the heat so it can cook and if it has to sit while you finish any other parts of your dinner it will still be hot. You could easily serve this a main course. Granted, the one we got was small but with a big enough head you could easily feed two people. Think about serving a nice salad with this as an accompaniment. 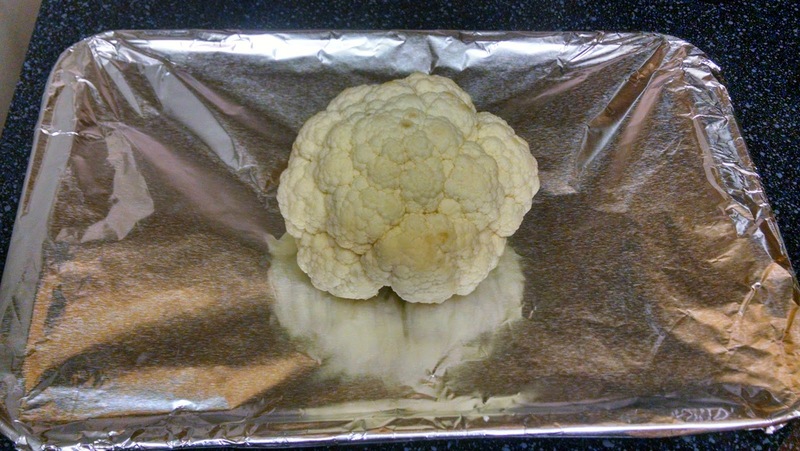 Once you open the cauliflower you may have to adjust the seasoning when you are ready to serve as the middle of the cauliflower could be bland. 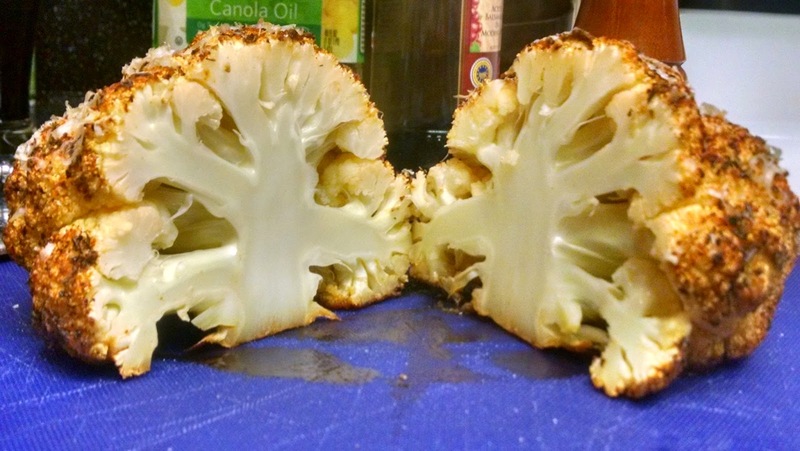 Again, Cauliflower is infamous for being bland, so season liberally. There are a ton of variations on this that you can do. In fact, ours uses freshly grated Parmesan cheese with about 15 minutes left to cook. Don’t worry it won’t burn, but just keep an eye on it.